Gone are the days where hiking boots were only for climbing mountains or rambling in the drizzle. Along with ‘ugly’ trainers, the hiking boot is the freshest footwear for autumn/winter, with breathable fabric replaced with luxurious leather and cosy shearling thanks to the likes of Moncler and Gucci. The boots look great with denim and a plaid shirt or a chunky knit for the weekend, or can be paired with an equally on-trend waterproof for long walks in the wilderness – perfect for looking cool while keeping warm this winter. Sorel’s hiker boots straddle the space between fashion and practicality, looking good while being rugged and waterproof - not bad for less than £200. 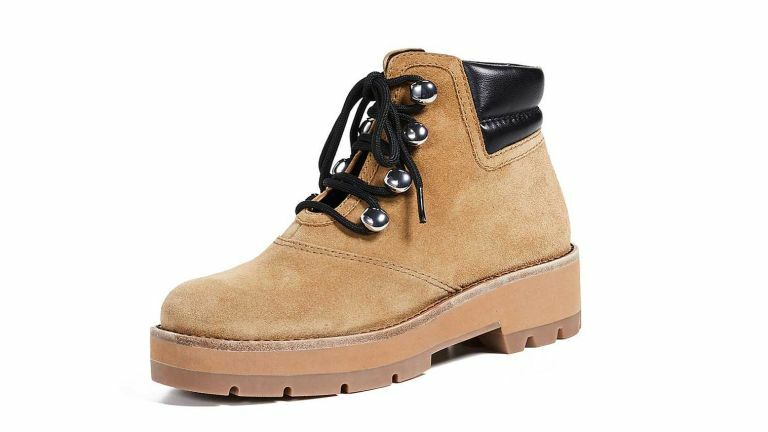 The boots are made of smooth nubuck and have padded leather collars and cushioned insoles for comfort on long walks in the wood, or a shopping centre. They also have chunky rubber soles and the toe has a slightly worn-appearance so they don’t look too new and awkward paired with a well-worn favourite pair of jeans. But perhaps their most striking feature is the blue climbing rope-inspired laces, which make a bit of a statement, but still work well with most casual outfits. If you’ve ever fancied yourself as an intrepid explorer and climber of mountains, you would certainly look the part in Officine Creative’s hiking boots, which are a luxurious take on a classic. Crafted at the family-run Duca Del Nord shoe factory, the boots are made from tough full-grained leather and lined with grey shearling, which is sure to keep toes toasty. Shearling is super fashionable at the moment, and the boots’ lining, which is just visible, would look great paired with a matching fuzzy jacket. While the boots cost a handsome £500, they will make a style statement for years without going out of fashion. If tan and black boots seem a bit boring, check out Montelliana’s silver hiking boots. A far-cry from mundane mens’ pairs, the Margarita style comes in cracked silver leather with white soles, which may not be too practical in the mud, but would look great with a pair of jeans in town. In fact, silver is an amazingly versatile choice for footwear, because it goes with everything, while making a statement. Despite the unusual colouring, the boots are made to last and be comfortable, boasting cowhide outers and shearling lining to keep your feet warm. Not too bad for £307. Moncler’s Peak hiking boots are seriously in fashion this season, boasting distinctive tricolour soles and laces, making them a good addition to a neutral casual wardrobe. As well as being on-trend, the boost are fairly practical, boasting so-called Vibram rubber lug soles and robust nubuck uppers. While they are padded and comfortable, with a design inspired by classic mountain climbing gear, the chances are that fashion conscious wearers may not want to get their boots too dirty, as they won’t get much change for £500. If traditional hiking boots are a bit classic for your liking and don’t match your brand-laden, athleisure wardrobe, the chances are that you’ll be lusting after these Gucci boots-meet-trainers. The hybrid footwear is made of leather, mesh and rubber and combines features of hiking boots, including a rugged sole and D-rings, with those of sneakers. The result? A super covetable style that will look great with an outdoorsy outfit, or paired with urban and sports labels, thanks to the SEGA- inspired logo on the shoe’s tongue. Made in Italy, the £760 boots nonetheless have luxurious suede details and insoles, and come in a Gucci dust bag. If you’re after the ultimate pair of luxury hiking boots, this pair by Bruno Cucinelli may be it. Hand crafted in Italy from brown leather, the boots are clearly inspired by styles worn to scale mountains in yester year, and feature gunmetal hooks and D-rings to secure the red laces in place. The boots are very structured and hard wearing with rubber lug soles, making them durable and practical. But it’s unlikely anyone is going to risk getting them too dirty braving the wilds of the great outdoors, because they cost almost £1,400. Just as Proenza Schouler puts a modern-twist on the satchel, its hiking boots combine classic details with trendy touches. The structured black calfskin boots have thick rubber soles and a padded collar, making them comfortable and practical for long walks, while chunky bright yellow laces make a stylish statement. Made for women who love the outdoors but don’t want to sacrifice on style, the £536 boots would look amazing with skinny jeans and a chunky knit, or paired with tights and a tartan mini skirt to nail one of this season’s hottest trends. But they’re classic enough to remain a wardrobe staple for years to come. Not all women’s boots have to be girly. Philip Lim’s Dylan style offer utilitarian style, but the four shiny D-rings and lacing somehow make them look a little bit feminine. Made of suede with a quilted leather cuff and rubber sole, they are designed to be practical and hard wearing, although owners may want to avoid muddy puddles, as they could easily mark the boots. Whether pairing them with jeans or a t-shirt, or toughening up a tea dress, these £459 boots will no doubt be a handy winter staple for years to come, even if they are probably more useful in a city than the great outdoors. It’s hard to find a pair of fashionable, quality boots that don’t cost the earth, but this pair from Tenzing offer similar features to far more expensive pairs, while giving you change from £200. Made of leather with a rubber sole, they look less rugged and more streamlined than other pairs, which may be a bonus if you are rangy. The boots come with both black and red laces, meaning they can be more eye catching when needed and boast D-rings and a glimpse of shearling, like many more luxurious pairs. The only downside is that the shearling is faux, so they won’t keep your feet as warm as the real deal. Too gentil to be real hiking boots, Loro Piana’s Aspen Walk walking boots ooze luxury and would be ideal for a stroll round the grounds of a stately home, or a ramble among the vineyards of Tuscany. You get the picture. The boots are made in Italy from soft brown full-grain leather and are trimmed with soft cashmere and lined in plush shearling, for the ultimate in luxurious comfort and warmth. They also have rubber soles and a water-repellent coating, making them practical as well pretty. The £1,335 shoes come with removable cushioned insoles and an extra pair of dark brown laces for a (subtle) change. While they may not be as striking as other designer options, these boots are more about a quiet elegance and could well be a fashionable heirloom.